The Silicon Valley crowd have started desperately funneling money into the Hilary Clinton campaign fund after it was revealed that Facebook affiliate and Oculus VR founder Palmer Luckey has been backing an online political action group which supports Donald Trump. They show their support not with money or direct campaigning, but by 'sh**posting'. If you're unfamiliar with the term, permit me to shed some light on it: sh**posting is the act of completely redirecting a forum or message board discussion from its original point by overloading it with irrelevant content, be it random, derogatory, vulgar, or all 3. The idea that any politically motivated group would use this as a signature weapon is ridiculous enough as it is, but the idea that it would have anyone as influential as Luckey supporting it is just downright horrifying. Luckey provided conflicting accounts. He first told Gideon Resnick that he was the Reddit user 'NimbleRichMan' who had asked for donations to fund Nimble America, a staunchly pro-Trump group. The group has previously taken credit for putting up a billboard of Hillary Clinton with the words 'Too Big to Jail' alongside it. They have also claimed to have 'conquered' Reddit and that 'sh**posting is powerful'. Meanwhile, NimbleRichMan has been doing plenty of sh**posting of his own. After The Daily Beast published the report, Luckey took to Facebook to refute all the claims to which he had seemingly previously admitted. Basically, Luckey has lied to somebody, it's just a matter of figuring out who. Given that, even in denying that his is NimbleRichMan, Luckey has still tried to put some distance between this and Oculus, which is a worrying notion. He's right insofar that none of this should reflect negatively on Oculus or their staff, but he is a controlling member of the company and his dishonesty will make people wonder about how safe an investment Oculus really is under his control. Some other entrepreneurs, including early Oculus developer Edward McNeill, openly admitted to donating money to Clinton as a direct response to the news about Luckey. Logan Olson, developer of the SoundStage VR program, donated a hefty chunk of profits to Clinton, and went on record to say that the VR community should support progress and diversity, and that Trump was the 'antithesis of those values'. All told, Clinton's cause will have recieved a considerable boost from this reactionary response, so in that sense Luckey may have done Trump more harm than good. 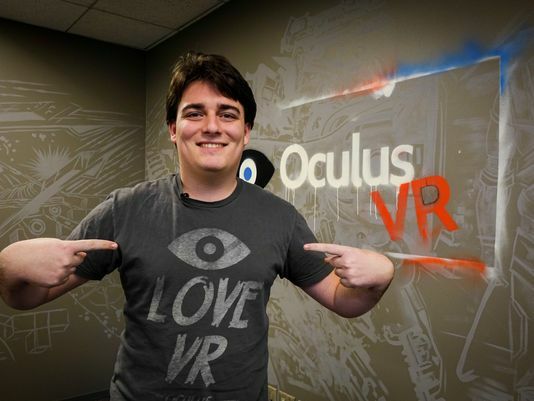 In the most extreme cases, some companies have actively refused to release content for the Oculus Rift until Luckey is removed from the company. Mark Zuckerberg has yet to make any statement on the matter, but it's probably only a matter of time. Luckey's political views aren't the issue here, it's a combination of his dishonesty and his apparent involvement with the kind of grotesque, backdoor agitation that Trump's campaign has been linked to from the outset. What Luckey does in his private time is his business, but this is a pertinent and potentially career-ending blunder that he seemingly could have completely avoided.